Because it serves those that have the ability to push for it: the industry’s elite and aligned interests. Those that control the millions of dollars in investments, thousands of employees, etc. (product franchisors, grocery, auto & oil, banks, sales agents, media) will pay for the flashiest but least substantial law (ie. 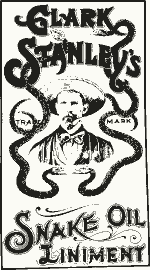 snake oil). A disclosure type law will not reduce investor business risk. It will give a false sense of security. The two state inquiries and recent widespread “blue chip” franchisor opportunism have shown how much of a farce the ACCC administration is. The ACCC must want to stop sweeping up after franchising’s elephant parade. McLaws have not worked in the United States for 50 years, including the toothless Federal Trade Commission Franchise Rule. The only franchise systems ever questioned are the ones stupid enough not to belong to the U.S. franchisor association. The big predators get a “Pass Go” with no private right of legal action. Disclosure laws primarily benefit one group: franchise lawyers. It is a virtual billable hour machine creating, maintaining and amending their incomprehensible fish-on-the-hook disclosure documents. Of course, the Australian government will say how they will NEVER, (and they mean it this time!) NEVER, EVER pass a good faith/disclosure law. They will be pushed (nudge nudge, wink wink) kicking and screaming by a heavy duty franchisee (don’t worry about the boy from Windsor: he’ll get his), naive academics & franchisee cheerleaders and puff journalists. The alpha male franchisor lawyer and his franchisor association will threaten fire and brimstone will descend on the Australian retail economy if passed. Think of Chicken Little being played by William Shatner. There is no overacting. The government will struck by a lightning bolt, fake incredulous and see the light (Can I have an amen? ), rise up on its two legs and pass with much fanfare announ: a “tough but fair” small investor law. The lawyers will be more in control of franchising than ever. The abuses will continue. more and more people will conclude that franchising is Unsafe at any Brand and Mom & Pop investments will collapse. This entry was posted on Monday, June 16th, 2008 at 1:16 pm and is filed under Bankers, Concepts, Confusion & Deceit, McLaw: Make-believe fairness, Opportunism, Unsafe at any Brand. You can follow any responses to this entry through the RSS 2.0 feed. You can leave a response, or trackback from your own site.